Jacqueline M. Shepherd married Michael K. Houghton, son of Kent Gould Houghton and Barbara McCormick. Jacqueline M. Shepherd and Michael K. Houghton were divorced. Michael K. Houghton married Jacqueline M. Shepherd. Michael K. Houghton and Jacqueline M. Shepherd were divorced. Michael K. Houghton married Kristina Neth. Kristina Neth married Michael K. Houghton, son of Kent Gould Houghton and Barbara McCormick. Ruth Bean married Basil J. Houghton, son of Allen Percy Houghton and Rosana Mae Yager, in circa 1947 mar 50 y in 1997. Allen H. Houghton married Ann Harter in between 1979 and 1980. Ann Harter married Allen H. Houghton, son of Basil J. Houghton and Ruth Bean, in between 1979 and 1980. Deborah Houghton married John Harvey. John Harvey married Deborah Houghton, daughter of Basil J. Houghton and Ruth Bean. Eloise Katherine Kautz married Proctor Willis Houghton, son of Phillip Allen Houghton and Evelyn J. (? ), in circa 1945 for 63 years. Alice D. Smith married Bruce Edwin Houghton, son of Proctor Willis Houghton and Eloise Katherine Kautz. Dyan Eagles married Mark L. Houghton, son of Proctor Willis Houghton and Eloise Katherine Kautz. Carol Lee (?) married Dean Houghton. Dr. Shannon Neville M. D.
Dr. Shannon Neville M. D. married Dr. Ashley McGarry Houghton M. D., son of Ashley McGarry Houghton and Delma Joyce Walls, at St. Francis Xavier College Church, St. Louis, MO, USA. Lona Powers married Sidney Charles Houghton, son of Charles Earnest Houghton and Ofie Kala (?). Thomas Edward Houghton married Janet Dressen. Thomas Edward Houghton and Janet Dressen were divorced. 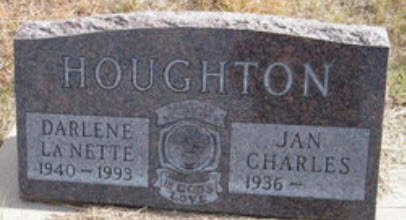 Jan Charles Houghton married Darlene LaNette Mahoney. Pat Houghton married (?) Wallace.